Gum Disease is a common dental problem that is usually the result of poor dental hygiene. If gingivitis or periodontitis is present, it is imperative to immediately get treatment to rectify the issue, as well as a rededication to vigilant brushing and flossing. Most people begin to notice gum disease when the tissues that surround the teeth (the gums) are bright red, bleeding, inflamed, or swollen. Gum disease starts when stray pieces of food mixes with saliva and bacteria in your mouth to form dental plaque. This plaque sticks to the surface of teeth and continues to grow unless it is removed. 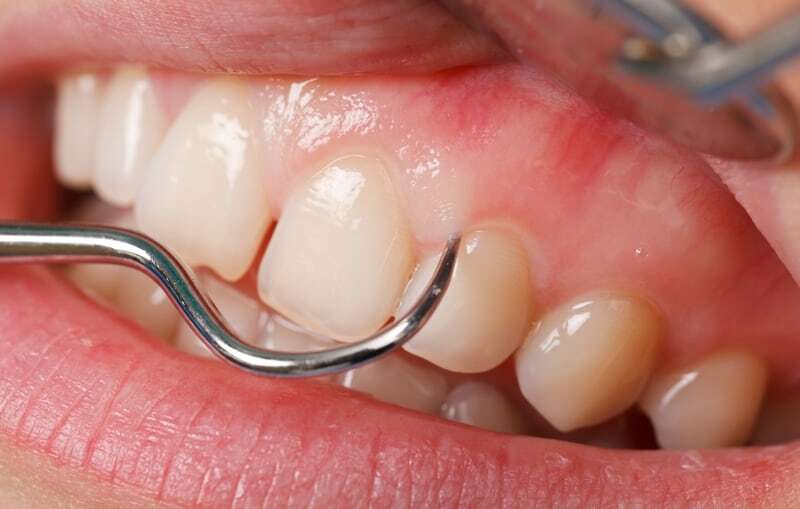 If plaque is not removed by normal brushing and flossing, it can harden and turn into tartar, which provides an ideal surface for more plaque growth and accumulation. Tartar is very difficult to remove with normal brushing and flossing and its continued growth can lead to further irritation of the gums (also known as gingivitis). As plaque begins to grow under the gumline, your body begins an immune response to combat the invading plaque and tartar (similar to your body’s reaction when you cut your finger). This response can inadvertently lead to damage of the underlying jawbone that supports your tooth. This bone destruction is called periodontitis. The beginning stages of periodontitis is mildly symptomatic. The first step in any treatment of gum disease is to figure out if there are any lifestyle factors that can be contributing to the disease, and if so curb those habits immediately. For example, a risk factor for gingivitis is smoking, so anyone diagnosed with gum disease should quit smoking immediately. Other risk factors can include but are not limited to: diabetes, aging, genetics, stress, inadequate nutrition, puberty, hormonal fluctuations, pregnancy, substance abuse, HIV infection, and possible medication use. The next step is removing any plaque and tartar that has built up around the teeth over time. This may involve a deep cleaning to clean underneath the gumline. Once the cleaning is complete, a reevaluation if performed one month later to determine whether a patient can maintain their gum health by rigorous brushing and flossing and regular hygiene visits with the dentist. In some cases, gingivitis can lead to periodontal disease, and if this is the case further treatment is needed. Laser treatment is a very effective way to treat gingivitis. A soft tissue laser is aimed at the gum pocket, working to eliminate bacteria that is nestled deep within the periodontal pocket. Laser treatment for gum disease will also remove damaged and unhealthy tissue, along with helping to stimulate the healing process. Black gum disease is very different from standard gingivitis, as it can progress quickly from minor to serious and requires immediate treatment. Also known as necrotizing ulcerative gingivitis or periodontitis, black gum disease goes beyond a standard infection, as it kills your own gum tissue. The black tissue that is visible is dead tissue. The best treatment for black gum disease is to manage pain while effectively removing the dead tissue. This treatment will be aided with a series of antibiotics to fight the disease. If you think you or your loved one may have gum disease, please schedule a consultation with Dr. Kwok at 619-543-0905. This entry was posted on February 27, 2018 by Kennie Kwok, DMD.